Two routers with their plunge locks removed. The one on the left has a twist knob lock and the beginnings of distortion of the soft pellet can be seen. The one on the right has its plunge lock lever removed and the spline moulded in the lever can be clearly seen. Plunge lock knobs and levers apply a soft brass alloy pellet to the plunge leg to lock the plunge. With twist knob plunge locks, these soft pellets mushroom with wear and cause locking problems. 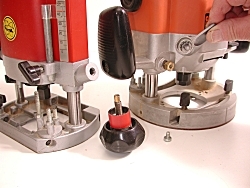 The immediate solution is to take a file and lightly stroke the mushroom edge to remove the built-up flange. The proper solution is to replace the pellet or, more likely these days, to replace the plunge lock knob. With lever lock types, there’s much less tendency for the pellet to mushroom, but as it wears it becomes necessary to press the lever further and further to lock the plunge. You can relocate the lever in a more comfortable position by locking the plunge, unscrewing the retaining screw that holds the lever to the plunge shaft and rotating it to where you want it. Most of these levers have some kind of spline arrangement to make the job easier. Note that the job can be much more fiddly if your plunge lock lever has a spring around the shaft.